My Queenless hive was just newbie Paranoia! After researching a potential issue with one of my hives documented here, I REALLY wanted to get back into the hive and apply the knowledge gained in my slightly panicked research. A short summary: wierd comb formation and no capped brood made me wonder if my queen had not made it. Unfortunately, it rained the entire week! Rain means grumpy bees who are not welcoming to intrusion. On Monday, I finally got back into the hive. Exactly as I suspected…well my second, more informed suspicion: its was a burr comb and nothing to worry about. 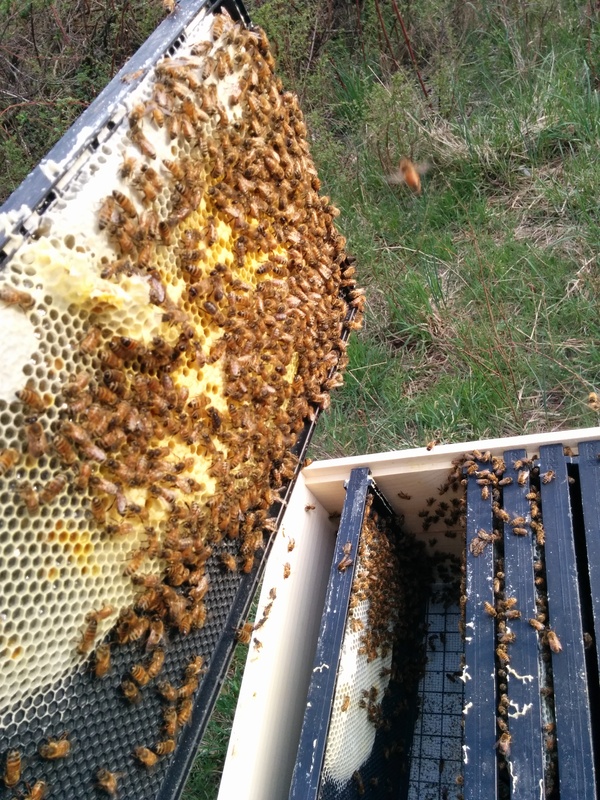 Additionally, there are two frames that contain eggs and capped comb! While this lags behind the other hive, its a great sign. Here are some pictures of the frame that started my paranoia. Note that the burr comb originally extended upwards but broke off when I removed the feeder last week so what is pictured here is only its remnants. For any other new beekeepers, here is what I learned. The abnormal wax formation pictured above is identified by regular shaped comb indicating that the bees found a bit of extra space and filled it as instinct determined. When installing the bee package, the queen cage was suspended in that exact location. The bees must have laid the foundation while the cage was in the hive then continued to build the comb onto that foundation after the cage was removed. The location at the top of the frame was another important factor here. I was worried that burr comb was a swarm or supersedure cell. Both are the size and shape of a peanut, exist without any normal comb and occur in the middle and bottom of frames, respectively. These indicate the bees are getting ready to swarm. I’m not qualified to comment on this as I have never experienced it. However I will say: removing the swarm or supersedure cells will NOT remove the urge to swarm. So all is well, including the unnerving blood red pollen the bees at hoarding from the blooming henbit.